This is a superb waterside plant and is much under-rated by gardeners. 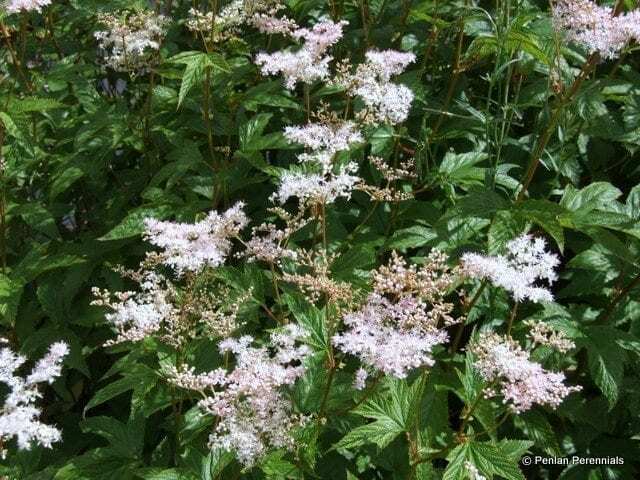 It is a very elegant form of the scented Japanese meadowsweet, with palmate foliage and white flowers with red anthers, making them appear a soft pink in colour. Excellent when planted in sun or light shade in a moist soil which does not dry out in summer. Meadowsweets have a good upright habit, with the flowers held clear of the foliage and do not need staking. A superb addition for a moist border or bog garden and an excellent backdrop to ponds. It cuts well too. Cut back hard in spring. Divide in spring to propagate.